Maharashtra Chief Minister Devendra Fadnavis has promised to release 2 tmc ft. of water after April 1 for the drinking water needs of drought affected areas of North Karnataka. The assurance was given to a delegation by Karnataka BJP leaders who explained the plight of the people in Belagavi, Bagalkot and other districts in the North Karnataka. 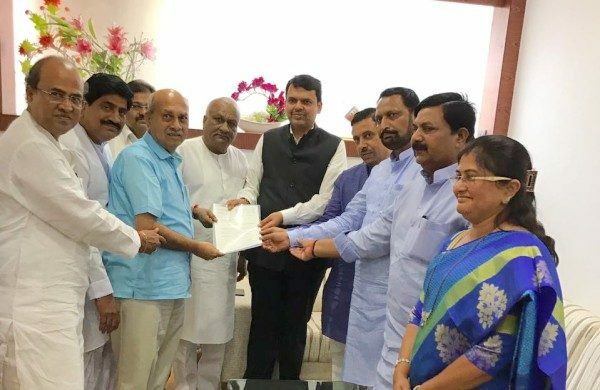 The leaders submitted a a request-letter to Mr. Fadnavis at his office in Mumbai on Friday. The leaders had a fruitful discussion for over an hour. Members of the delegation included former Minister Laxman Savadi, MLA; Rajya Sabha member Prabhakar Kore; Bagalkot MP P.C. Gaddigoudar; Mahantesh M. Kavatagimath, MLC; Raju Kage; Duryodhan Aihole and Sashikala Jolle. Several villages along the Krishna in these three districts were facing acute drinking water shortage. Plight of both farmers and cattle is miserable and they were undergoing forced-migration leaving the aged and physically disabled to survive on their own. Now these people are Approaching Maharshtra Governement (BJP) for Water from Maharshtra, but in Karnataka, Congress proposing and pursuing Kalasa Bhandura Project in Khanapur Taluka Belgaum District, they are not thinking of Bad effects of it on Belgaum District, due to the Diversion of Water from this River in Western ghat, even after the Central Water Board Ruling against it That time they think the principle of ONE INDIA. ?? BHARAT Without boundaries ??. Good deed. Shows excellent neighborly relations and hell to people who play dirty games in name of caste, language, religion.